Root canal therapy is a treatment alternative to extraction for patients with nonvital teeth. 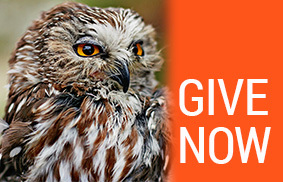 Nonvital teeth include discolored teeth and teeth with pulp exposure. Sometimes teeth that are neither discolored nor have pulp exposure are found to be nonvital based on radiographic evidence. 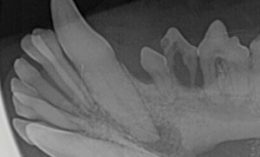 Radiographic signs of a nonvital tooth include a wide and/or irregular pulp canal, periapical lysis, and apical lysis. Pulp exposure resulting from a crown fracture or excessive wear may result in a pink, bleeding pulp. 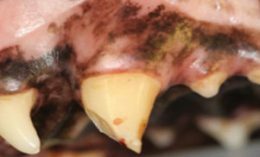 Chronic pulp exposure could result in a pulp polyp, dark brown or black pulp, or a site of pulp exposure with dental calculus overlying it. Figure 1. 304 with periapical lysis indicating endodontic disease. 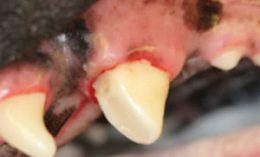 Most of us have had the experience of owners reporting no clinical signs associated with what we suspect is a painful tooth in the animal. If pulp exposure has been chronic, the pulp within the tooth may have very little innervation. Some human patients report that an acutely fractured tooth is painful when the newly exposed nerve is exposed, becomes non-painful when the pulp dies, and then becomes painful again after the bone surrounding the tooth root begins to be affected. Figure 2. Excessive wear resulting in reparative dentin and vital teeth with the exception of 402 which has pulp exposure. t elect root canal therapy. Either choice is an appropriate choice. Reasons for electing root canal therapy instead of extraction might include prevention of a surgical extraction; root canal therapy involves a light cure restoration and very little restrictions at home. Occasionally, an owner observes a tooth fractured right in front of them. 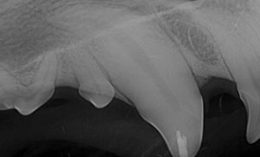 An acutely fractured tooth, especially in a young dog, is a unique opportunity to maintain a tooth as a living tooth through vital pulp therapy. Vital pulp therapy may be appropriate for a tooth with a known and observed time of fracture. The best candidates for this therapy are patients who are less than two years of age and have a crown fracture that happened less than 48 hours prior to presentation. Figure 4. 204 following root canal therapy and restoration. Figure 3. Complicated crown fracture of 204. 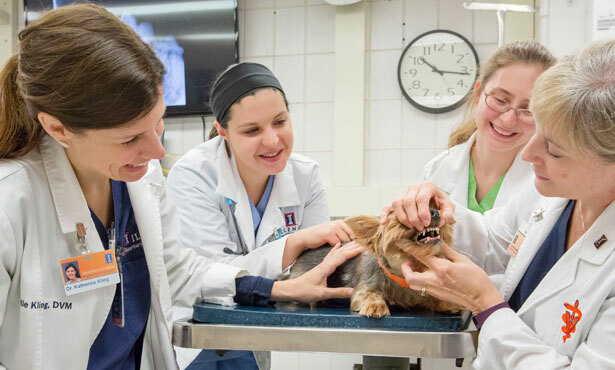 The priorities for different owners and different pets may vary with the overreaching goal of achieving function and comfort for our patients. In certain cases, where function and comfort can be maintained while avoiding an extraction, more treatment options are available to our patients. Figure 5. A tooth previously treated with vital pulp therapy with a dentin bridge underlying the MTA and restoration. 1. 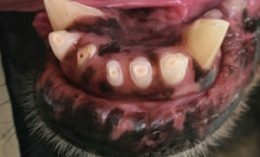 Menzies, R. A., Reiter, A. M. & Lewis, J. R. Assessment of apical periodontitis in dogs and humans: a review. J Vet Dent 31, 8–21 (2014). 2. Luotonen, N. et al. Vital pulp therapy in dogs: 190 cases (2001-2011). J. Am. Vet. Med. Assoc. 244, 449–459 (2014).